There are several ways to use the wallbox buttons. In my Wurlitzer project I use the original keyboard buttons with a Teensy 3.2. I added some additional buttons which will use the Teensy and GPIO. First thing you wanna do: get a multimeter and find out how your keyboards work. So, if you count one wire more than buttons of a keyboard, most likely there is one common wire and this common wire connects with the very button which you press. Identify that common wire (using the ohm measuring) and mark the other ones which get connected to common when pressing a button with its number. Modern keyboards are wired in arrays (matrices) to reduce the number of wires. But first tell us what kind of keyboard you have and then we can assist you with the next steps. The buttons are mechanical (spring loaded) .They are wired to a pcb board with one central ground on a sliding mechanism that slides back and forth when a button is pressed.The button itself slides forward to make contact on the pcb board and close the connection. The wiring harness is very convoluted and hard and to follow but it does end at several old connectors. This unit I believe was made in the seventies so it is a little dated . I would like to keep the original retro look of the box as much as possible but I think I might have to look at a modifying a USB keyboard. I recently saw a video on YouTube ( I believe it was posted by Mike the author of fruitbox) where he showed his setup and the buttons he used. I am sure this would work but I can’t seem to find anymore information about the parts he used and how to set it up. The author used a PS/2 controller to connect the keyboard to the PC. A button press starts a series of pulses like an old telephone, but this cannot be understood by fruitbox. Would be better to get direct access to the buttons and wire them one by one to GPIOs and a common wire to ground. Do you (or a friend) have access to an oscilloscope to monitor the pulses when a button is pressed? Would also be good if you could find some more details about the boxes - a technical manual could help ... If not available a precise picture of the wiring around the buttons would be also helpful. If you could identify the common wire, this is the beginning. Then press a button and see what wire is connected to common, mark it. Press the next one, identify the wire which is connected to common, mark it etc. This is a schematic of the Rock-ola Wallbox 507 and includes the wiring of the pulse generator inside the selection wheel. I suspect that it might be a bit tricky to read those pulse information precisely into the Raspberry (maybe with the help of another microcontroller or directly). This manual refers to a special hard-/software kit which reads those pulses from the pressed key(s) and translates it into an action to play a song (but the whole package is limited to a maximum of 160 songs - no comparison with the almost unlimited potential of fruitbox). But it shows where to get the signal line and hook up a converter. But as said in my previous post: it would be much easier to have a direct access to each individual button. If the mechanic and local space allows and - if those buttons just work "mechanically" - you could mount a small pcb with micro switches behind those buttons which then close those switches when you push them. Ok, - I am just guessing while I have no exact clue about the mechanics and electrics in your wallbox. But hope you get an idea what I mean and what you could do. fruitbox v1.14 is now released! Thanks again for the quick response. I am going to try and use the mechanical portion of the switches / buttons and skip the whole wiring harness. I will figure out a teensy board for the inputs. Documentation is vague relating to the walboxes themselves and hard to get a hold of. It’s funny you mention wallbox 2mp3 . I actually bought 2 of these sometime ago I did manage to get them working but was not happy with the audio output so I scrapped them. They are sitting in a box somewhere. This is a work in progress so I will keep you posted on the final solution. Looking forward to building a full size retro looking jukebox and this is my starting point. Is there any support for multiple unique title strip designs, set on a per-strip basis from a database or genre variable? The jukeboxes I've seen invariably have a scattered assortment of title strip designs. Sometimes these differences are arbitrary, but other times it's specific to the type of song.. For example, holiday songs will show up on title strips with little Christmas trees on them. If there's no support currently, is it something you'd consider implementing? I'm looking to make use of the [status] Output parameter. I see that some folks have already done so, I think I saw mention of a scrolling LED display and a thermal printer, there may have been others. Any chance one of you could share the code or relevant snippet of code used to read and act on the resulting text file? I'm particularly interested in using C++, python or bash. Would it be possible to add a parameter to designate the sound device used for the sounds defined in the [sounds] section of fruitbox.cfg? This would allow users to send the music to one device, say an amplified sound card with good speakers, and mechanical related sound effects like the coin drop or page move to another, say a cheap speaker inside the jukebox cabinet using the pi's built-in audio out. I suspect this could be done using the [status] output feature and an external player, but, I believe this would be a better approach. FWIW, mpg123, which I believe you've used as the player in fruitbox, has that capability using the -a switch. I'll certainly look into it (the sound output), and also I'll try and sort out the stdout bleed -through you reported. I am using libmpg123, which is a C library, not actually mpg123, but mpg123 also uses the same library so maybe I can find out what it's -a option is actually doing code-wise (although I suspect it's not using anything from the libmpg123 library directly). Thanks for looking into this. I suspect you're right that it's not using anything from the libmpg123 library directly. Not really knowing what to look for I stumbled around the source files for mpg123 and it seems any refrences to ALSA are in the libout123 modules. Unfortunately I don't know enough about C++ to be of any real help. Even though I'm barely past the "Hello World" phase in learning C++ I am attempting to build fruitbox using your instructions in build.txt. WARNING: libdumb >= 2.0 or <= 0.9.3 not found or compile test failed, disabling support. WARNING: libopus not found or compile test failed, disabling support. Are these expected or should I be tracking them down? Backing up a bit, I recall that when I installed the allegro dependencies my system gave a number of messages that some packages were being substituted. They went by so fast that I couldn't keep track and since nothing seemed to be left out I didn't worry about it too much. I'll try to go back and document them and, if I can figure it out, send you the updated build.txt through github. You can ignore those warnings... when you build Allegro it had lots of different capabilities... if you don't have all the dependencies then not all the capabilities are enabled, but this isn't a problem as they are not required by fruitbox. That is mine jukebox thanks a lot for the program chundermike! Did you build the jukebox case yourself or is that an old enclosure which you could use? And: what size does your LCD screen (touch or non-touch) have? 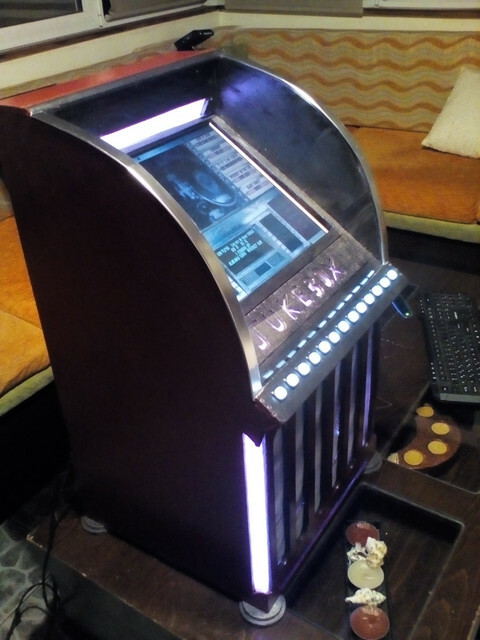 I am considering to build a new jukebox from scratch for my son, so I am currently collecting some ideas for simple, but good looking enclosures. Just thought I would share what I did with Fruitbox. Picked up the AMI wallbox for $10. I felt a little guilty lol. Retrofitted with a monitor and pi them polished it up. Had to rewire the original buttons from NC contacts to NO contacts. Works like a charm. Lots of little quirks to get it to work along the way. A youtube video from start to finish would be great. Picked this Bad Boy up for a whopping FREE. Didnt feel guilty about this one. Was sitting out in the rain. The touch screen monitor works but have no idea how to configure it with the Pi. Tried to pile through the post in here but I was lost. I will add in a bank of buttons where the bill acceptor was and will be good to go. I installed a 5volt sound activated color changing led strip inside the perimiter and hacked a computer power supply to power everything in it. I found a tutorial on adding an on off button to the pi and it works great with fruitbox to power down and power up. *** You need to use the lite version of rasbian for fruitbox to work with a usb keyboard. If you use the full version as soon as you launch fruitbox the usb keyboard will appear to no longer function. Keyboard is actually is still working in the background but you can not see it because fruitbox is ontop. Took me a long time to figure that out. If you use a program like Filezilla to ftp into your Pi from another computer it is much easier to navigate the pi and upload and change configurations as well if you do not have the GUI from the full version. Just my 2 cents. I'm not expert in Raspberry. Is it possible to install fruitbox on Raspberry that automatically starts? Two things need to happen to have fruitbox start up automatically: You need to configure the raspberry pi to sign in the pi user on start up and you need to configure fruitbox to run when the user pi signs in. Under the 3rd menu item "Boot Options" there should be the option to start in terminal mode (CLI) and sign in the pi user. adding a # in front of it will disable it if you want it to go back to normal or delete the line all together. It wont take effect until you save your changes and reboot. You will need to reboot your Pi for the changes to take effect. I bought it on amazon. I probably could have found something a little better suited but got tired of looking at all the specs and picked this one because I could get it to work. I used some aluminum angle iron fastened it to the top and bottom of the wallbox page turn frame and then used double sided foam tape to adhere the monitor to that. Fruitbox Random playback of songs?